With all things ‘love’ on the chart for today, there’s no better way to celebrate Valentine’s Day, International Book Giving Day (aka #bookgivingday) and Library Lovers’ Day with some especially special and adorable books with your loved ones. Here are a few to make your heart sing and add a warm smile to your day. Hello Little Babies, Alison Lester (author, illus. ), ABC Books, December 2016. Welcoming and watching your little one’s as they grow and change in this big, wide world is a truly heartwarming and precious experience. 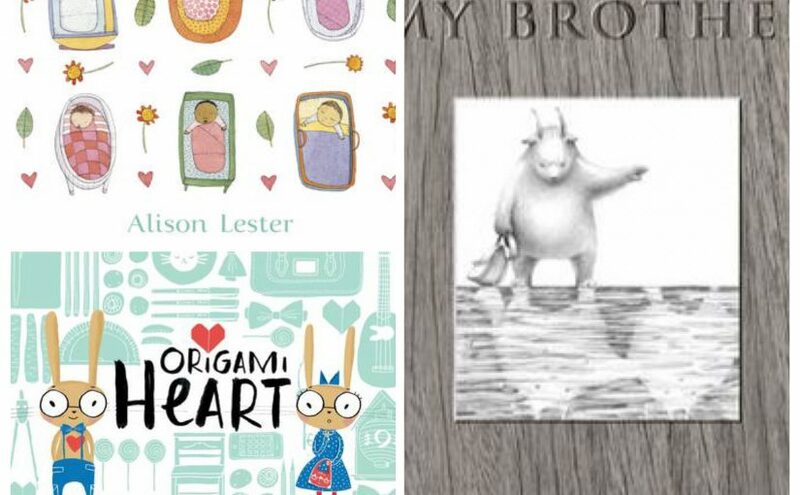 Alison Lester expertly caresses our hearts with her divinely narrated and illustrated glimpse into the developmental stages of six babies’ first year. With the birth of Alice, Ruby, Mika, Zane, Vikram and Tom, the diversity of cultures, traditions, abilities and behavioural routines are portrayed with a beautiful synchronicity. Sleeping habits are formed with the jiggling of cradles, rubbing of little backs and strolls by the sea. Playing involves rattles, baths, a game of peekaboo and a favourite book. I love the messy food and eating behaviours, and how the babies are beginning to move about at different levels of independence. They are exposed to the beauty of nature through exploration and observation, and then it is time to say goodnight. With its simple sentences and individualised colour vignettes for each baby, the reader is able to identify the characters and move through the pages with ease. And Lester’s ability to highlight cultural and developmental differences speaks volumes, particularly in today’s society and for new, overly-conscious parents. 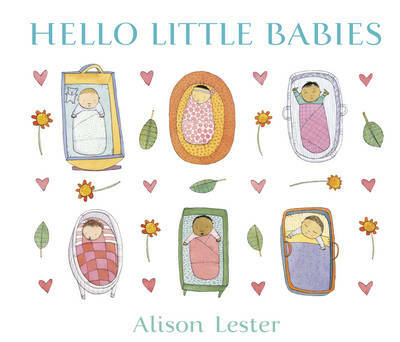 Hello Little Babies contains the perfect bundle of love to share with your perfect bundle of joy. Origami Heart, Binny Talib (author, illus. ), Lothian Children’s Books, June 2016. I love the Asian-infused qualities in this bunny’s tale of striving for perfection, high expectations and overcoming disappointment in the name of friendship. And I also love that the guts and passion addressed in the story shows us that reaching out, sharing your heart can lead to a happy ending. The quirkiness of Kabuki begins when he is introduced to us from his burrow in the sky. He is the neatest, most organised and pedantic bunny in town, habituated to his strict routines and obsessive behaviours. In preparation for a visit from his friend Yoko, Kabuki picks up ‘perfect’ vegetables, ‘excellent’ snow pea tea, and ‘symmetrical’ flowers from the market. Everything is set in rows and cut to exact heart-shaped proportions. He is ready. However, his scrupulous plans are set to take a nose-dive when he hears of Yoko’s cancellation. But rather than wallow in his own grief, Kabuki literally throws his heart out to the city, and guess who’s there to catch it! There is a strong character personality and equally meticulous line drawings and simple colour palette to match, but there is also a gentleness and endearing tone with its soft, handwriting text and little details like the displayed photographs of Yoko and the tiny red birdie that stays by Kabuki’s side. 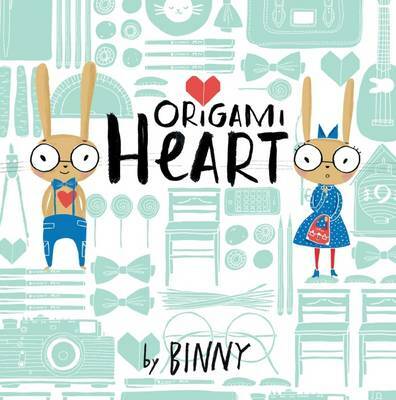 With bonus origami instructions at the back, Origami Heart will have preschoolers pronouncing their love for this book, and for each other, over and over again. 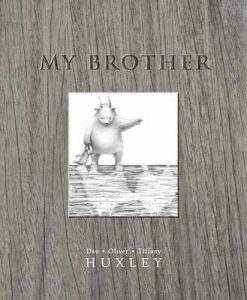 My Brother, Dee Huxley (author, illus. ), Oliver Huxley (character, illus. ), Tiffany Huxley (design), Working Title Press, July 2016. Expressing love of a different kind, this story takes us on a heavenly journey of brotherly love. Created as a team, the Huxleys’ exquisitely haunting plot and mesmerising illustrations powerfully stir up the emotions in your heart and the curiosity in your mind. With the strong opening, “I miss my brother. I’m so lost without him.”, the gentle, horned creature immediately grabs us by the horns and locks us in to his endeavour to find his long-lost sibling. Like black and white photographs in an album, we are treated to landscapes that defy logic and immerse our thoughts in old nursery rhymes and imaginative places as the creature desperately searches far and wide, over here and over there. There is certainly no need for descriptive phrasing when the graphite pieces of art tell it all. An ‘enlightening’ finale brings joy, colour, purity, and a sense of peace when the brothers reunite once more. This book is amazing for its endless talking point possibilities, such as the meanings of being ‘lost’, the yearning for loved ones, and reality versus the imaginary, mystical or even the spiritual world. My Brother can be appreciated on many levels, from the simple to the complex, however ultimately it is a book of pure beauty, extraordinary wonderments and undying love. A few weeks back I finished a May Gibbs Fellowship*, a creative time residency organized by the May Gibbs’ Literature Trust. It’s for children’s authors and illustrators, and during the Fellowship you get to spend ONE WHOLE MONTH away from home writing (or illustrating). One whole month without school lunches, sport’s training, dentists, vets, committee meetings, and the list goes on. Of course I missed my family desperately, but I can’t tell you how wonderful it was to have 16 to 18 hours a day to dream, plot and write – and of course READ! I managed to finish writing an entire first draft of a new YA novel while I was there, blogged regularly, came up with a new book idea, and a name for another book – and of course READ. I also did eleven workshops at the State Library of Queensland, working with school groups, showing kids from years 5 to 10 how to develop heroes and villains for their stories. All in all an amazing experience, but there’s more. May Gibbs Fellows who stay in the apartment, leave at least one of their books behind in a special locked cupboard. Opening the door was like going into a magical world, going back in time, back to when the authors and illustrators were in this very room creating many of the books that were now in the cupboard. It was inspirational to reflect on their experiences and enjoy reading some of the published works that had resulted from their Fellowships. Coincidentally, Little Paradise was the book that Gabrielle worked on two years ago for her May Gibbs Fellowship, and it was launched the day I started my Fellowship in Brisbane. Exploring the world and works of these authors made me feel like a small child again, and I wondered if perhaps a book chest, secret book cupboard or even a book treasure hunt might be a way to inspire young readers around the home. It worked for me.